All rituals conducted during day time is done so on “Vyshakham” day. 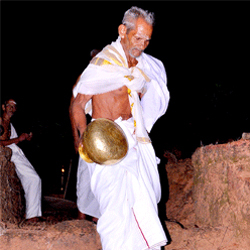 Also all the rituals take place at “Manathana” about 10 Km away from Kottiyoor. Palm leafs, Lamps etc. From ‘Karimbanagopuram’-is also the starting point for many other things. Used for covering Ammarackal thara , other important holy sites start off from Manathana. Rites called “Yogiyoottu” and “Kalasham varavu”take place at “Puthanaakool”, near Karimbanagopuram. As night falls, Swords from Chapparam Bhagavathi temple, and pooja vessals, ornaments etc, kept at Karimbanagopuram set out for Kottiyoor. Swords are carried by “Vaalashan” while the “Bhandaram” is brought in by “Kudipathy”. Gold and silver ornaments, pooja vessles etc, are carried as “Kavu”. The procession moves at a steady, determined pace and speed accompanied by music and elephants. With “Vaallaattom” and distribution of prasadam at pre determined places, and finally reaches Ekkere Kottiyoor by midnight. Sword from ‘Muthireri’ and sacrificial idols are taken and the procession proceeds to Akkere Kottiyoor. This marks the beginning of daily poojas, and entry for women. From then onwords, 36 types of abhishekams, Ushapooja, Usha Sheevelli, Usha Nivedhyam, Panthiradi Nivedhyam, Aayiram Kudam Abhishekam, Athazha pooja, Sheevelli, Nivedhyam, Sreebootha bali, are done on a daily basis.